Daily Debate: What’s Your Favorite Zelda-Related Addition to Super Smash Bros. Ultimate so Far? Nintendo unveiled Super Smash Bros. Ultimate last week with a showcase of the myriad characters returning to the fray. Although only a few new characters were announced, series creator Masahiro Sakurai emphasized his team’s efforts to make as many of the 62 preexisting fighters feel fresh. Nowhere is that more apparent than with the game’s Zelda challengers, as several of them are sporting new designs and moves since their previous outing. 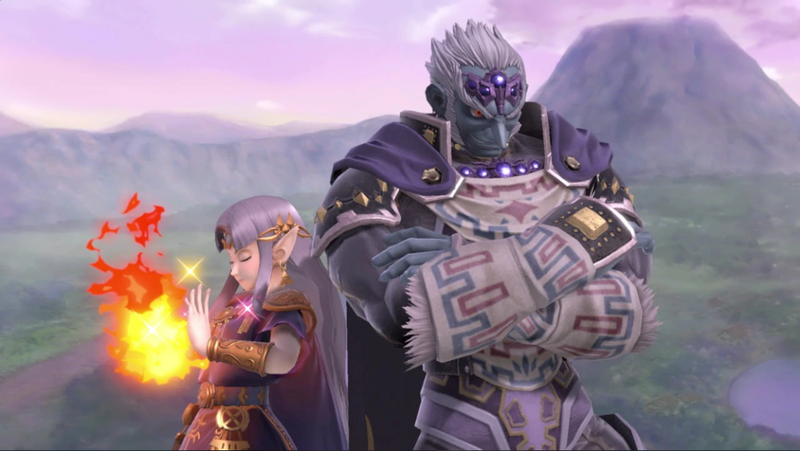 Previous Super Smash Bros. entries based the Triforce trio of Link, Princess Zelda, and Ganondorf on only one Zelda game at a time. Melee focused on their Ocarina of Time incarnations, while both Brawl and Super Smash Bros. for Wii U/3DS took cues from Twilight Princess. Naturally, considering Breath of the Wild has become the de facto face of the franchise for many people, I assumed this latest installment would go all in on representing Link’s latest quest. However, with a history as rich as The Legend of Zelda’s, I love that Sakurai chose to spread the love with the game’s character designs. Although Link himself sports his Breath of the Wild outfit, Princess Zelda fights as her A Link Between Worlds incarnation, while Ganondorf returns to his iconic Ocarina of Time design. Indeed, it’s fantastic to see this kind of variety on display this time around. I’m digging Princess Zelda’s new look in particular, given Sakurai’s rationale behind the decision. He mentioned that Breath of the Wild’s more research-oriented Princess Zelda wouldn’t be as well suited toward Super Smash Bros. as some of her more regal, magic-savvy counterparts. The fact that the guy thinks about details such as those is telling of his passion for both The Legend of Zelda and Nintendo’s history as a whole. What about you, though? What Zelda-related addition to Super Smash Bros. Ultimate are you the most happy about? Have you been waiting ages to see the return of the Great Bay stage? Are you as big a fan of the new character designs as I am? Are you excited to finally see Ganondorf use his sword in battle? Let us know in the comments below!